In light of a Tuesday announcement from Sen. Orrin Hatch, R-Utah, that he will retire at the end of the year, Mitt Romney, former Massachusetts governor and a vocal critic of President Trump, is eyeing the longest-serving Senate Republican's soon-to-be-open seat. While Romney has not publicly announced his run, several Republican sources tell CBS News that the 2012 GOP presidential nominee has been quietly preparing for Hatch's retirement. Offering another hint at his potential run for the Utah Senate spot, Romney changed his Twitter location from "Massachusetts" to "Holladay, UT" soon after Hatch announced that he will not seek reelection. Hatch's decision to leave the Senate may have disappointed Mr. Trump, who repeatedly encouraged him to run for an eighth term. And despite the Mr. Trump's endorsement of Romney's presidential bid in 2012, their relationship has been fraught. Here's a look at their ups and downs. Romney called then-candidate Trump a "phony" and a "fraud" during a scathing speech at the University of Utah. He also warned Republican voters that Mr. Trump's policies could lead to a recession and called on them to vote for another conservative candidate in the primaries. "Here's what I know. Donald Trump is a phony, a fraud," Romney said. "His promises are as worthless as a degree from Trump University. He's playing the American public for suckers: He gets a free ride to the White House and all we get is a lousy hat." The ruthless speech lasted 20 minutes. In response to Romney's comments from earlier that same day, Mr. Trump later said in a rally from Portland, Maine that "he was begging for my endorsement" in the 2012 presidential election. "I could've said, 'Mitt, drop to your knees.' He was begging me," he said. "The last election should have been won, except Romney choked like a dog," Mr. Trump said of Romney's 2012 run for the presidency during a New York rally. "He choked. He went 'I can't breathe! I can't breathe,' he said." Then-candidate Trump emphasized the point by making a choking gesture. Ahead of the July 2016 Republican National Convention in which Mr. Trump secured the GOP nomination, Romney said he might vote outside of his party and cast a ballot for Libertarian presidential candidate Gary Johnson. "I'll get to know Gary Johnson better and see if he's someone who I could end up voting for," he said. "That's something which I'll evaluate over the coming weeks and months." Then-president-elect Trump and Romney played golf at his Bedminster, NJ course. Romney said they had "a far reaching conversation with regards to the various theaters in the world where there are interests of the United States of real significance." Mr. Trump told the press "it went great." 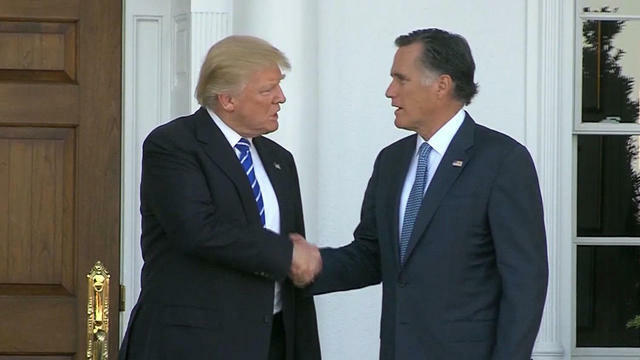 Romney and Mr. Trump met for dinner during which Romney reportedly pitched the president to consider him for secretary of state. Mr. Trump eventually chose Rex Tillerson for the post. Romney condemned Mr. Trump's response that the blame for violence in Charlottesville, Virginia stemmed from "both sides"-- both the white supremacists leading the rally and their counter protestors. "This is a defining moment for President Trump," Romeny wrote in the post. "But much more than that, it is a moment that will define America in the hearts of our children. They are watching, our soldiers are watching, the world is watching. Mr. President, act now for the good of the country." On the same day Mr. Trump reiterated his endorsement of Alabama Republican Senate candidate Roy Moore, Romney criticized the candidate. "Roy Moore in the US Senate would be a stain on the GOP and on the nation," Romney tweeted, referencing multiple allegations of Moore's sexual misconduct involving teenage girls. "Leigh Corfman and other victims are courageous heroes. No vote, no majority is worth losing our honor, our integrity." White House counselor Kellyanne Conway said that Mr. Trump and Romney discussed congressional Republicans' tax plan over the phone, according to CNN. The call came after the president's Dec. 4 trip to Utah in which, during a speech, he praised Sen. Hatch and encouraged him to run for reelection. Romney notably did not attend that speech. Conway said that Romney and Mr. Trump have a "great relationship." Should he enter the race, Romney would be the favorite to win both the GOP nomination and the general election in November. Utah is one of the most solidly Republican states in the country, although Mr. Trump won the state by a much smaller margin than Romney did in 2012. Meanwhile, White House Press Secretary Sarah Huckabee Sanders said Wednesday that she has not spoken with Mr. Trump about potentially campaigning for Romney in the event that he does officially run and that he has not committed to campaigning for the Republican nominee for the seat.